The recently tabled Ontario provincial budget sees big changes across the board for drivers in Canada's most populous province. Under Doug Ford's Progressive Conservative government, there has been a flurry of smaller changes, such as changing the slogan on licence plates from "Yours to Discover" to "A Place to Grow," and one big new vision for auto insurance that will (hopefully) mean increased savings for Ontario drivers. At this time, Ontario drivers pay some of the highest insurance rates in Canada, with those in the GTA paying even more money than others. For example, the average premium for a 35-year-old driver in Brampton, Ontario is estimated to be $2,494/year. The Ontario government says it is taking steps to improve the situation for drivers. "When it comes to driving, it is clear that Ontario's auto insurance is broken, and drivers deserve better," said Vic Fedeli, the Ontario finance minister, when explaining changes in the recent budget. This includes the introduction of the "Driver Care Card" card, which the provincial says will make insurance claims easier to manage for residents. The debit-style card is to be used when making insurance claims; following an accident involving a vehicle, funds paid out in an insurance claim would be loaded onto the card, which the cardholder can use for benefits such as rehabilitation and physical therapy. The government says this "care, not cash" focus will ensure that a driver's insurance policy accurately pays for any treatment needed after an accident. It also paves the way for cash settlements after an accident. In its response, the Insurance Bureau of Canada (IBC) welcomed the step by the Ontario government. The agency referred to a 2017 report by David Marshall that focused on Ontario's auto insurance system, which noted the high amount of benefits money that has been going towards contingency fees of lawyers, rather than policy holders themselves. These recent changes will re-evaluate that arrangement, with the goal of making sure consumers are protected and insurance agreements are transparent. "The Government has put Ontario drivers first with this budget. [This] announcement focuses resources squarely where they should be: on helping those injured in auto collisions recover," said Kim Donaldson, vice-president for Ontario at the Insurance Bureau of Canada. The government is also raising the default benefit for catastrophic injuries from $1 million to $2 million. The Ontario government is also proposing measures to ensure more choice in insurance coverage options along with and better control over the prices people must pay for insurance. The budget says rates will be reduced, but there are no details as to how much of a reduction drivers may see. According to the government, more flexible regulations for insurance providers will result in an increased range of plans for drivers and more competition between insurance providers themselves. For example, this could mean you'll see highly customizable "pick the coverage you want" models popping up. At the moment, there is still no information on what types of coverage a drivers may be able to opt out of, but providers will be allowed to offer new types of discounts to drivers. The government also plans to allow for more varied pricing structures, such as a pay-as-you-go insurance system. It is also saying it will take steps to stop what's called "postal code discrimination," which is when insurance companies charge you more or less based on where you live. If you frantically search for your proof of insurance in your glove compartment, the government may have some relief for you. 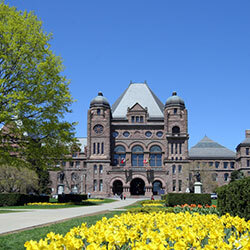 Ontario is now investigating how it can roll out electronic proofs of insurance. In a bid to make things even easier for the consumer, it will now allow for electronic commerce and communications between insurers and clients. While the Ontario government is reducing some red tape by improving how auto insurance rates are regulated, it's going to be up to the providers to make these changes in the end. As companies begin to think about and explore these new systems, it's likely that there will be more offerings and more competition among companies. Hopefully, that means cheaper car insurance rates for people in Ontario down the road.